I sincerely wish you the best of luck with that. Far too few of those gems out in the world as it is. The only source of ready-made parts for these would be other 75mm Fat Biotar lenses, such as a broken, parts copy. But those would be rare. The only alternative would be to make one yourself, using the other blades as a pattern. 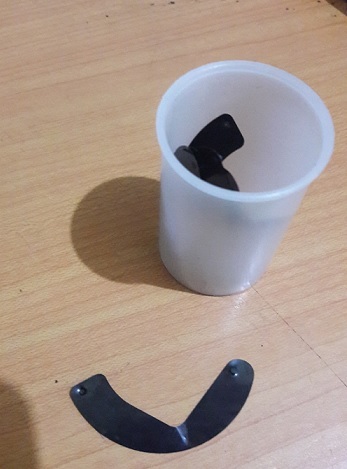 I have run across cases posted on the internet of people who have made replacement aperture and shutter blades out of various materials, one being steel shim stock. I don't think you need to use spring steel like the originals (spring steel will last longer though) but the thickness will need to be identical or very close. The pins can be cut from a proper guage of brass wire, and held in the blade by peening (flattening with a little hammer) as the originals were. This would all require a bit of ability as a craftsman. Lots of filing and fitting. Alternative would be to find similar diameter cheap zoom lens and harvest complete aperture system. Much easier to improvise aperture lens connection then to make blades. Post a picture of the blade on a ruler or pin to pin measurements , then anyone that's working on a lens can compare the blades in their lens to yours. You may find a blade with a similar measurement but likely a different shape, more like a ) and less like a 7. I don't see any reason why changing type wouldn't work. our technican checked,we should make model for your sample,and the model is about 600 USD. and after the model,the price of the sample is about usd3,thankyou! I think if you only need 20 pcs,it is very expensive,thankyou! Fix the broken blade, why not? Pin broken? Make new pin. Blade bent? Flatten, same technique as automobile body repair.